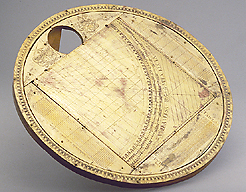 This quadrant consists of copper plates nailed to a wooden base. The compass is missing, but on its sides are engraved two coats-of-arms, one of which is surmounted by a mitre and a crozier. Underneath the central square plate is an inscription in ink, with the name of Ildephonsus Mahler of the Benedictine order and the date 1759. It is unlikely that 1759 is the date of the whole instrument, so it has been suggested that this central wooden part is a replacement. Another possibility is that the inscription itself has been added later.